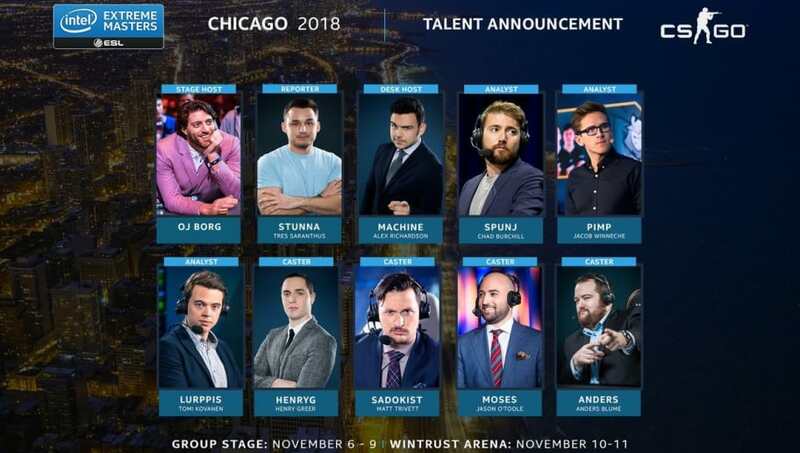 IEM Chicago organizers revealed the broadcast talent that will be a part of the Counter-Strike: Global Offensive tournament beginning Nov. 6. ​​The talent line-up for IEM Chicago was revealed Tuesday by organizers in preparation for the event. There are 10 broadcasters covering the ​CS:GO tournament. Oliver James "OJ Borg" Borg will be the stage host for IEM Chicago, and Alex "Machine" Richardson will be the desk host. Chad "SPUNJ" Burchill, Jacob "Pimp" Winneche, Tomi "Iurppis" Kovanen are the analysts. IEM Chicago's commentators are Henry "HenryG" Greer, Matthew T"Sadokist" Trivett, Anders "Anders" Blume, and Jason "moses" O'Toole join as the analysts. Tres "stunna" Saranthus is featured as an interviewer for the event. IEM Chicago will feature a $250,000 prize pool. Natus Vincere, Astralis, BIG, FaZe Clan, Fnatic, Team Liquid, MIBR, mousesports, NRG, and Renegades will attend as the invited teams, while ​LDLC, AVANGAR, North, Eunited, MVP PK and Luminosity will compete as qualified teams.